“Tis the Season” is an oft-heard phrase when November and December roll around. From hanging holiday décor to taking pictures with the guy in the red suit, we partake in a slew of activities in the spirit of this time of year. However, there are some less-than-pleasant activities that come with the territory, too: traveling, rushing around, spending time in the cold, losing sleep. And, although it’s not a confirmed fact by any means, this might just be the worst time of year to get sick. For this reason, we have compiled a list of six tips to help you stay healthy over the holiday season and into the New Year. Though you might be caught up in the festivities of the party, you still need to hydrate yourself. Make sure you grab a glass of water or two while you celebrate. The more you drink, especially before you go to sleep, will help diffuse the effects of a hangover in the morning. Water intake is also super important for those who plan to travel by plane this Christmas. Sip eight ounces of water for every hour that you’ll be in the air in order to keep your body’s mucous membranes moist so they can do their job, which is to keep bugs out of your body. The holidays are a time of joy, love and meals — lots of them. Rather than indulge at every single meal, choose a few special occasions where you will enjoy yourself a little more than usual. A cookie here and a glass of eggnog there can really add up, so make sure you’re willing to work it off in the gym. Otherwise, feast wisely – especially if you’re drinking. We all feel rushed in the evenings when we get in after a longs day and it's all too easy to reach for a take-away menu. There are some simple alternatives you can take to make your diet a little healthier without having to make major changes to your lifestyle. Check out this guest post from Katybeth Dee to find out more. It’s easy to curl up around the fire at this time of year, but do so only after you exercise for a bit each day. This way, your holiday indulgences won’t take as heavy of a toll on your body. Even if you’re staying at a hotel, it’s often possible to squeeze in a workout. Most lodgings boast pools or exercise rooms. This goes for those traveling, too. If you’re hopping aboard a plane this winter, take a few laps up and down the aisle if your flight is a long one. This keeps blood flowing; if you’re susceptible to clots, this is an extremely important tip to follow. Between holiday parties and early-morning sales, sleep schedules often get hit hard during this time of year. Make sure you’re catching as many Z’s as possible, though, because too little sleep can decrease the power of your immune system while increasing your stress levels and, often, your weight. Even a quick catnap in the car or on the plane can work wonders. Naps at work are often seen as a sign on laziness but in actual fact they can help boost your productivity. Not convinced? Amy Highland gives you some great reasons why a quick 40 winks could see you getting more done. 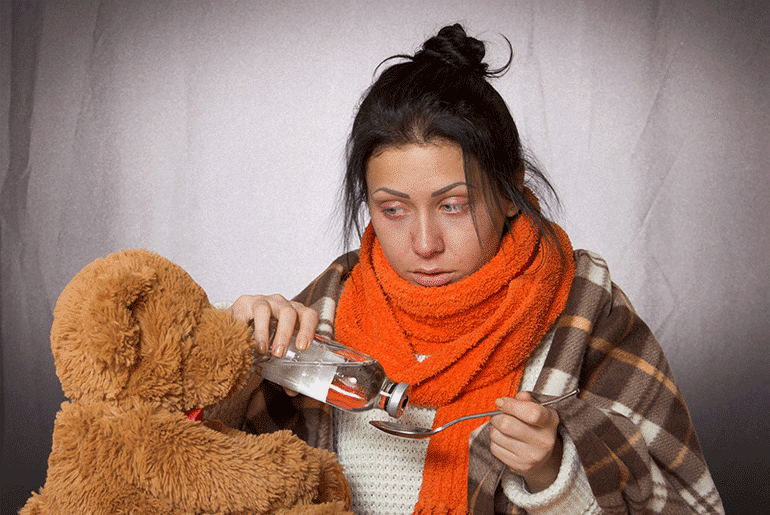 Colder weather brings colds with it and, as previously mentioned, no one wants to be sick at Christmas. For this reason, make sure to mind your surroundings and sanitize them as much as possible. This is especially important if you’re relying on public transit this winter. Pack a set of disinfecting wipes and wipe down your space: chair, tray table, arm rests, seat-belt clasp, air vents. Regardless of this, keep hand-sanitizing gel on you at all times. This might be the most important tip of all. The holidays simply will not be enjoyable if you’re stressed. Whether it’s a pesky family member or mall crowds that make you ticked, you should have a solution ready to deal with them: meditation, massage, a yoga class, or whatever else relaxes you. Make this season a memorable one for all of the right reasons.